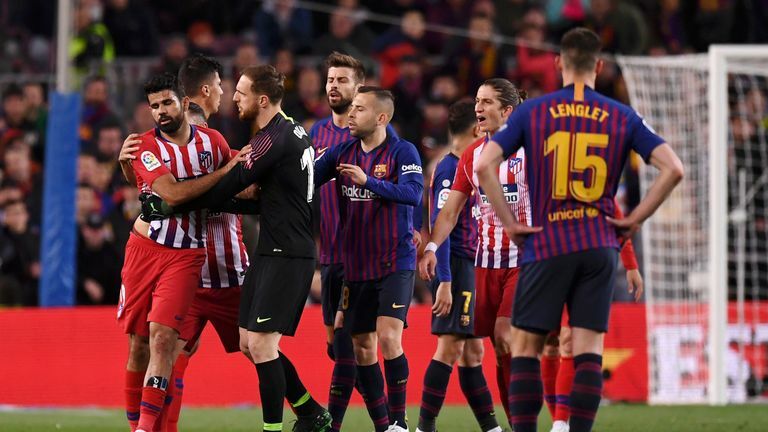 Atletico Madrid striker Diego Costa has been hit with an eight-match ban after hurling insults at the referee during his side's 2-0 LaLiga defeat to FC Barcelona last weekend. He grabbed Manzano's arm at one point and players from both teams tried to contain him. "It's bad news", Cerezo said on Thursday. "Insults should never happen on the football field but there are times when they do happen". Costa has endured a hard season, having scored only five goals in all competitions and missed nearly two months at the start of the year due to a foot injury. "I asked the referee if what he said was so bad because we have seen Barca players do the same thing, saying things right in the referee's face and they did not get sent off, they got away with it", Simeone said. Earlier, it was reported that match referee Gil Manzano awarded the red card to Costa following his inappropriate comments during the Barcelona game on Saturday. For each of these respective incidents, the former Chelsea man has been given four-match bans - the total ban amounting to eight matches hence.